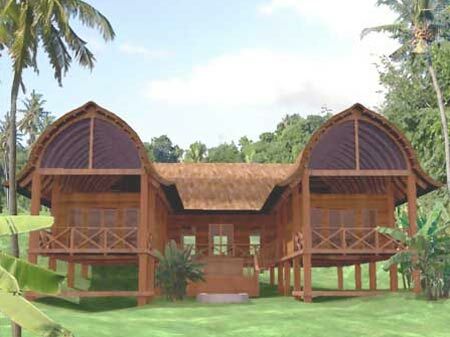 For building YOUR HOUSE IN BALI you can choose from a variety of HOUSE TYPES we have built, and are available within four to five months. PLUS you can develope your own design, together with our architect and designer team. In this section you get to see types, material used, and prices. Contact us for further questions. 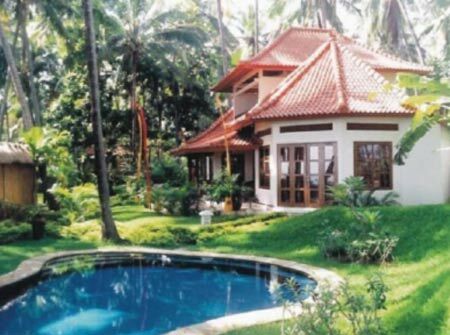 Complete residential units with pool, guest house, master house, external kitchen and bar, staff quarters. Land. 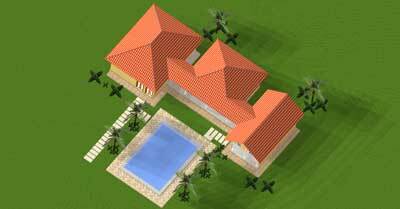 A Minimum of 8 Are (800m2, 8500 square feet) is required. 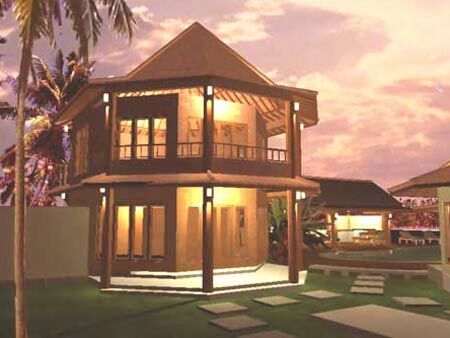 * Two story main house, octagon shaped, with balcony, veranda, bathroom. * Two story three bedroom house. 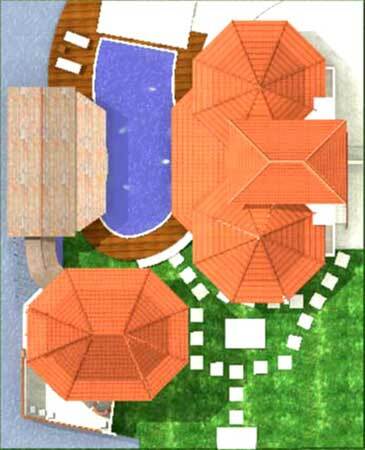 * Swimming pool with deck on three sides. seen from the other side, across the entrance. Front right is the semi open kitchen and lounge. 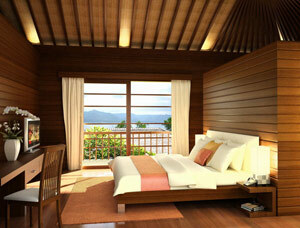 Left: three bed room Villa with balcony and veranda. 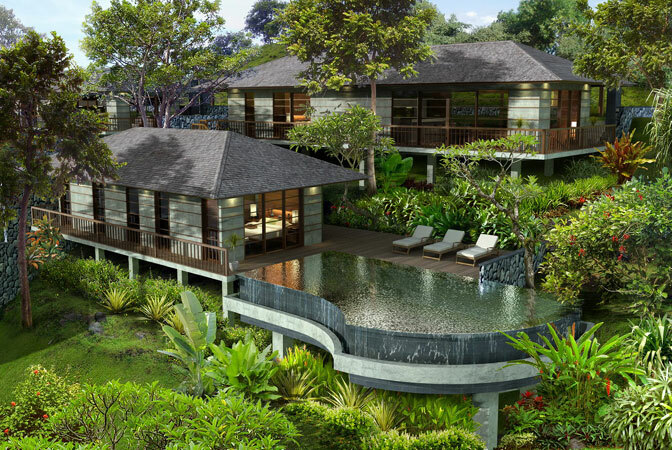 Back right: the two bed room Villa, balcony and veranda. 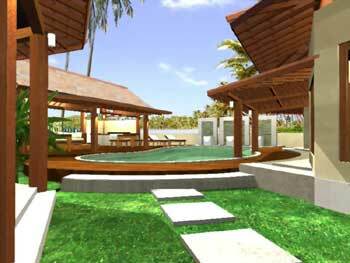 We build Villa compound Natah anywhere in Bali, if you have/choose your own land, or have it built ready for you at the beach of Bali's North West Coast on 8 Are land. 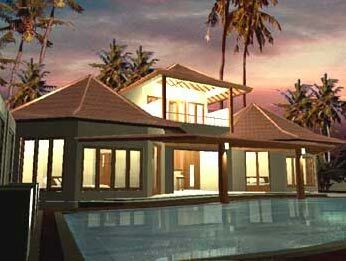 * main house, with kitchen, one bedroom, bathroom, living room, with veranda, . * Two room bedroom house, with two bathrooms. * Semi open kitchen and lounge near the pool, office room. Three bed rooms, two bathrooms. Lumbung is the traditional Bali style house, two stories on stilts. The u-shape combines two bedrooms, two bathrooms, a kitchen. Studio or library, two lounges. Balcony, and Bale-lounge for sitting on lower level. Good for big families, or two families. 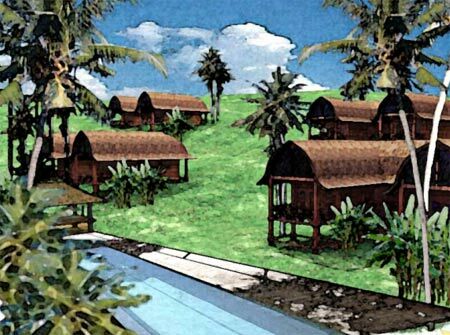 Or it can be built anywhere in Bali, where you want to find land, or have land already. 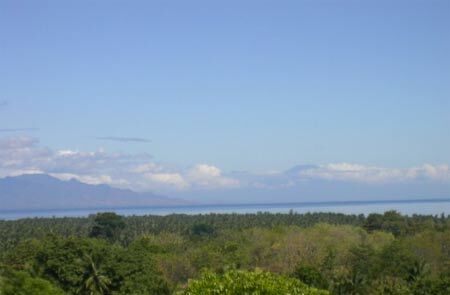 As projected on HILLSIDE, overlooking Lovina Bay and North Bali coast. Two bedrooms, two bathrooms, octagon shaped.